Since man’s earliest time, he has relied on rocks for his very existence. Humans fashioned their first tools from stone. They learned how to build fires for cooking, warmth, and protection by striking sparks from stone. Stone walls were the early artists’ first canvases. Later, great buildings and cities were constructed of stone. Given man’s continued dependence on rock, it is little wonder that stones would evolve into man’s earliest symbol of divinity. At first, stones were worshipped as a manifestation of God himself. Later, stones were considered God’s dwelling place. Megalithic monuments were erected for sacred ceremonies all over the world. These ancient stone shrines remain standing as a testament to man’s belief that there is power in rock. In Chile, massive stone statues keep watch over Easter Island. The pyramids in Egypt tower above the sands. At Carnac in France, rows of monoliths stand at attention over grassy fields. And most famously, Stonehenge in Wiltshire, England reminds us that early man was industrious and clever as well as spiritual. But stones from Ireland have long held a mystique of their own. Myths abound of the supernatural power of Irish rocks. One reason for Ireland’s strong belief in stone magic could be attributed to the Celts and their religious devotion to rocks. Ireland boasts of the greatest collection of wishing and cursing stones anywhere in the world. The famous Blarney Stone near Cork, Ireland is a perfect example. The legend says that those who kiss the rock will be granted the gift of gab. Many visitors to Blarney Castle risk bending over backwards to reach the stone with their lips in the hopes that a little luck will rub off. Tory Island is no exception to the Irish rule. As small as this island is, it boasts two magical stones–the Leac na Leannán or Wishing Stone and the Cloch na Mallacht or Cursing Stone. The Wishing Stone sits at the top of Balor’s Fort. It juts out on a cliff 100m above the Atlantic Ocean. A wish is granted to anyone who is brave enough to climb on top of it. Anyone lacking such courage may also be granted a wish by successively throwing three stones onto its crest. The Cursing Stone was located at the west end of the island, but it is now mysteriously missing. It was part of a holy pilgrimage called the An Turas Mór. 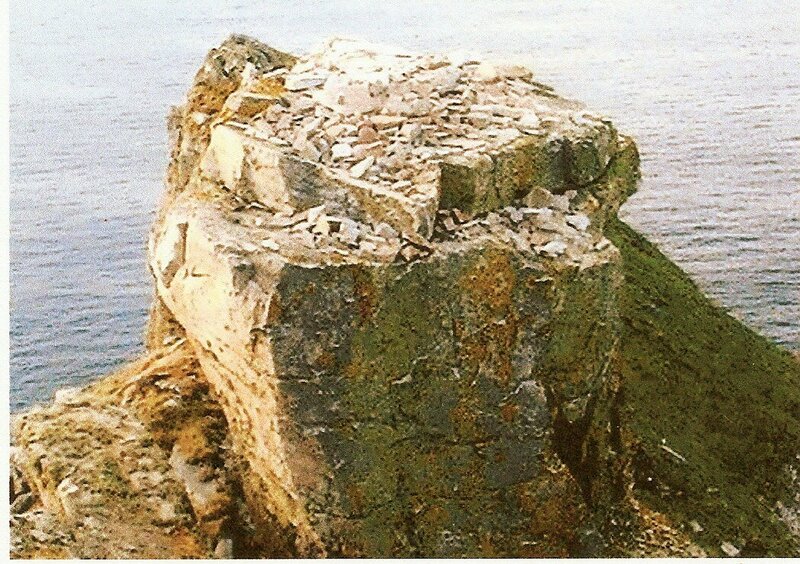 The last time the stone was seen was in 1884 when it was allegedly used to curse the English tax ship the HMS WASP and cause it to wreck on the rocks of Tory. Now all that remains is the Cloch Arclai, the cursing stone’s pedestal. In my novel, Island of Tory, I use the legends of these magical rocks to weave a tale of the possible consequences of the curse on the island and its inhabitants. I imagine that the islanders are stuck in time because of their malevolent behavior. Because they cursed, they shall be cursed, an Irish version of karma. Island of Tory is due to be released by Loconeal Publishing in March 2012. Posted in Tory Island, Writing and tagged Balor's Fort, blarney stone, curses, cursing stone, Easter Island, Geither, HMS WASP, Irish curses, Loconeal Publishing, magic, magic stones, megalithes, pyramids, Regina M. Geither, reginamgeither, rocks, Stonehenge, stones, Tory Island, wishing stone, writing. Bookmark the permalink.